Lines Stay the Same, Only the Numbers Change (but not all of them). 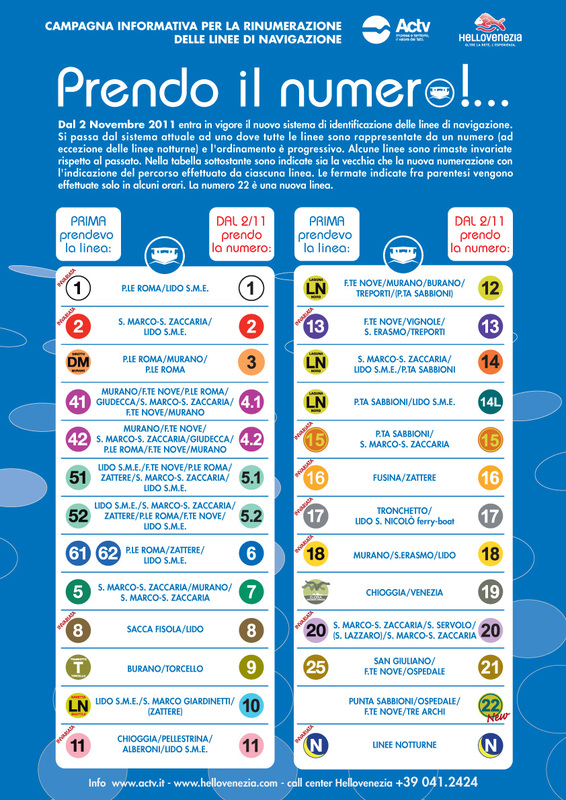 As of November 2, 2011, ACTV Spa and the City of Venice will implement a new numbering system for vaporetto public transport lines. The changes also include a new landing system that uses numbers, colors and letters which could, should help newcomers find the landing they’re looking for more quickly. Speriamo bene. The new system does not affect routes and frequencies, just the numbering and organization. Finally, there is a new Line 22 which serves Punta Sabbioni – F.te Nove – Tre Archi which has been a special line will now become a regualar one. At larger piers like Piazzale Roma, the railway station, Rialto area, Fondamente Nove, San Zaccaria, and more, you’ll notice that the landings will also be identified with a capital letter placed on the entrance of the pier. This letter will also appear on the maps along the ACTV quais, and will associate the vaporetto lines with the landings that serve them. The letters will also appear on the LED signage indicating departures and times. With any luck and a little patience, this new system should benefit both locals and travelers, who normally have little time to get up to speed on vaporetto usage. For more information, see the ACTV site (in Italian). This entry was posted in Getting around town, Venice Instructions, Worth Noting and tagged ACTV, transporation, vaporetto, venice on October 15, 2011 by Living Venice.